The Electronic Point of Sale (E-PASS) system will be implemented from April to check irregularities in the ration system. There are 403 ration shops in 14 zones in the district, Lakshmana 98,000 895 Food Security Cards, 12233 FSC Cards, and 180 Annapurna Cards. The government has decided to implement the e-Pass system in the wake of the supply of goods from the Civil Supplies Department to the black market. He said the preparations for the implementation of this policy in the district were discussed. 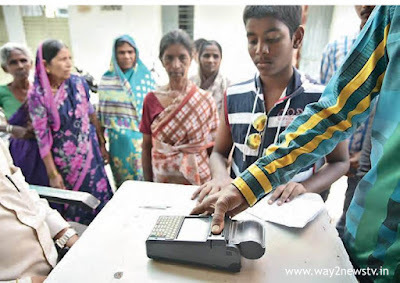 One of those named in the ration card went to the ration shop and told them that they wanted to take the fingerprint on the electronic machine. With this approach, those who have the card will only need to go to the ration shop and take the goods. The ration dellars would also be incapable of causing any irregularities. In recent years, the government has made appropriate arrangements in the wake of rice and kerosene fraud in the recent past. If you do not take the goods in the ration shop, the quota will be reduced next month.